High pressure laminate cladding (HPL) ... HPL is a perfect material for surfaces that require enhanced durability and impact resistance. The product is ideal for facade cladding, balcony infills, soffits, solar shading and may other different applications. 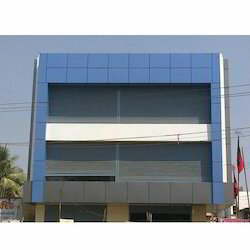 We are engaged in offering a wide range of ACP Panel Cladding Work to our valued patrons. Personnel who render these services have deep knowledge that helps to provide these services efficaciously. In addition to this, these services are acknowledged for its low cost. Owing to the rich industry experience, we are able to render Stylish HPL Wall Cladding Service. We are involved in presenting an exclusive range of Granite Wall Cladding Service. All our experts are work in close proximity with patrons to achieve desired results.Apart from this, our experts try to incorporate all the specifications provided by clients in final output to win their trust. 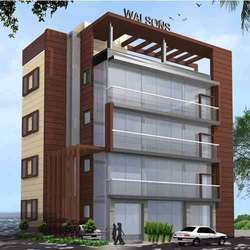 Being the well-distinguished companies in the market, we are into providing Wall Cladding Work. In the above application, bamboo boards are cut into strips and then “threaded with stiff wire to create a screen. Notice how the designer has then bent the stiff wire to create the shapes against the cladded wall and positioned the lighting to create an effect with the shadows.